Venetian Blinds for windows are, without a doubt, some of the most popular blind fixtures in the city. More and more residents of Melbourne are realising that, regardless of the type of home they have, there is a Venetian Blind configuration to bring their space alive. There are a lot of pros and cons to choosing Venetian Blinds for your home or office. 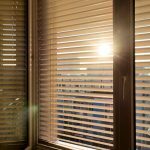 Today, we list just some of the pros of opting for Venetian Blinds, and some reasons to perhaps choose another window furnishing. Control: Venetian Blinds are an extremely flexible blind option for your windows. They are great in the sense that they offer full control of privacy, light, view, and air flow. In any space, it is important to have as much direction over these elements as possible, to create a space that is as harmonious as it could be. Value: Venetian Blinds also offer great value for money. They are one of the more economically priced window furnishings, and they don’t skimp on functionality. Easy Maintenance: Venetian Blinds are one of the easiest blinds to keep clean, as they simply require the sweep of a vacuum to maintain. Due to their rotating nature, they can be cleaned effortlessly. Options: Available in a countless number of colour and material combinations, Venetian Blinds are very customisable. This versatility has led to the inclusion of Venetians in spaces of all types. They can fit a contemporary space as well as they do a traditional. While there are no real cons to Venetian Blinds, it is helpful to consult the experts the blind experts if you aren’t sure of the right window furnishing for you. This way, you can determine the absolute best blinds for your space from all the options available. For help selecting the most appropriate Venetian Blinds for your space, feel free to contact us on 03 9544 4999. Our trained team is always happy to help.